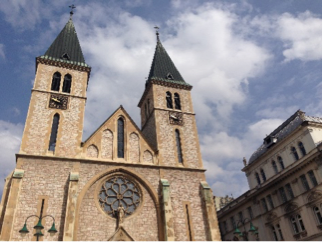 Boasting a wide tourist industry with a fast-expanding service sector, Sarajevo is a year-round vacation destination. Featuring Soviet architecture, several cultural museums, and important historical sites, this is a city perfect for any type of trip. Sports enthusiasts can visit the facilities of the 1984 Winter Olympics and the skiing facilities on Bjelasnica, Igman, Jahorina, and Treskavica. History buffs will appreciate the city as a site of past (and ongoing) conflict—a plaque marks the spot where Franz Ferdinand was killed, and the Sarajevo Tunnel Museum allows visitors to experience the “Tunnel of Hope”—the underground passage used to escape during the Siege of Sarajevo. The sieges and wars are at the forefront of Balkan history, and pieces of these experiences are scattered throughout the city of Sarajevo. History museums, galleries, and public monuments pay tribute to those who died in the 1990s. Though a visit to this city may be a sobering experience, it provides an opportunity to more concretely understand global conflict. Yeah, agreed Javier. I did a small tour of a few Balkan countries, and it’s crazy to see how differently each nation and city has addressed the war. You can’t even tell there was bloodshed in Dubrovnik. Also, I don’t know if it’s still there, but there’s an incredible photography exhibition on the siege of Srebrenica—highly recommended as a way to start your trip. It’s tough to get through, but it really puts things in perspective. My trip to Sarajevo changed my life. I took a class on genocide and global conflict while in high school, and we learned all about the Bosnian conflict. I never thought I’d travel here in person, but I’m so glad I did.